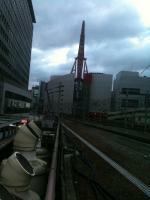 I just arrived at umeda station in Osaka. I recognized this building, hep 5. I was suppost to meet saki at the hankyu umeda station, but the night bus stopped at the jr station. I found the hankyu station easily but i couldn't find saki. I ended up calling her from a payphone which cost quite a bit here. That day we ate some takiyaki at the waterfall. It was much better then I remembered. Oishi kata.. We also went out to a nice restraunt for tea cause it was sakis mums bday just before.